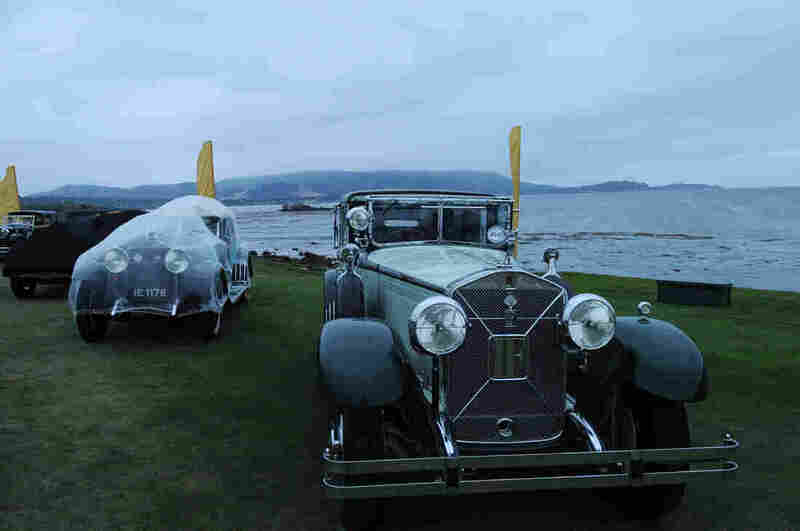 Before sunrise, a 1928 Isotta Fraschini Tipo 8A S Castagna Landaulet on the Pebble Beach Golf Links’ 18th green for judging. The car is owned by Peter and Jennifer Gleeson of Edmonds, Wash. Pebble Beach Concours d’Elegance is where hundreds of the wealthiest car collectors buy, sell and show off their cars. Classic car shows are a summer tradition. But if you want the most exotic, rare, and the most expensive cars in the world, then you need to head to the Monterey Peninsula, Calif. 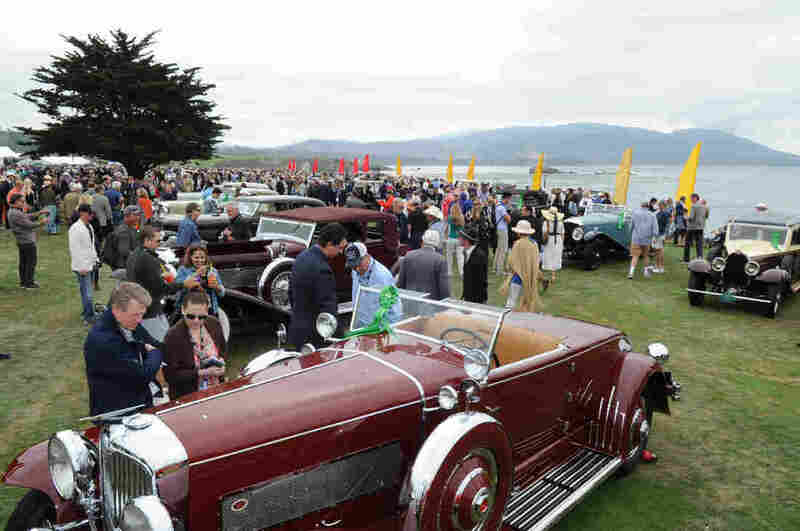 The 67th annual Pebble Beach Concours d’Elegance caps off a week of intensive, obsessive car love. The Concours this year features 204 of the highest-caliber cars that have ever been made. Essentially, the international car world descends on the region. 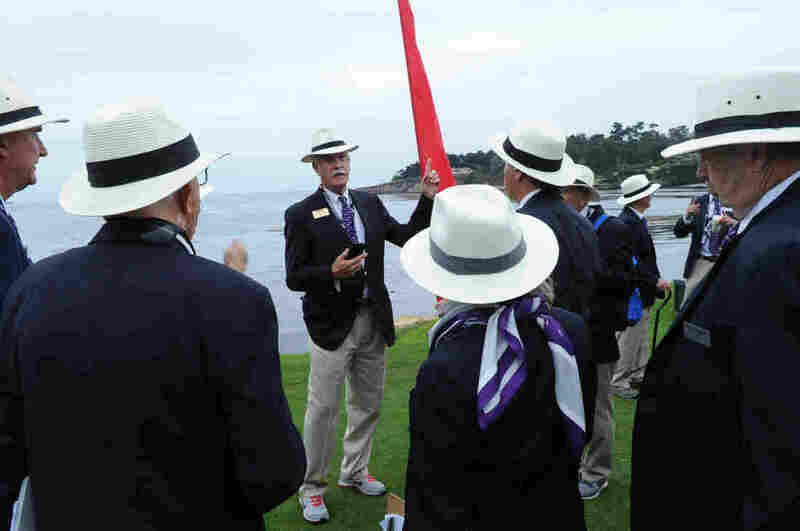 Fifteen countries and 31 states enter the elite car show held on the famed 18th hole of the Pebble Beach golf course. 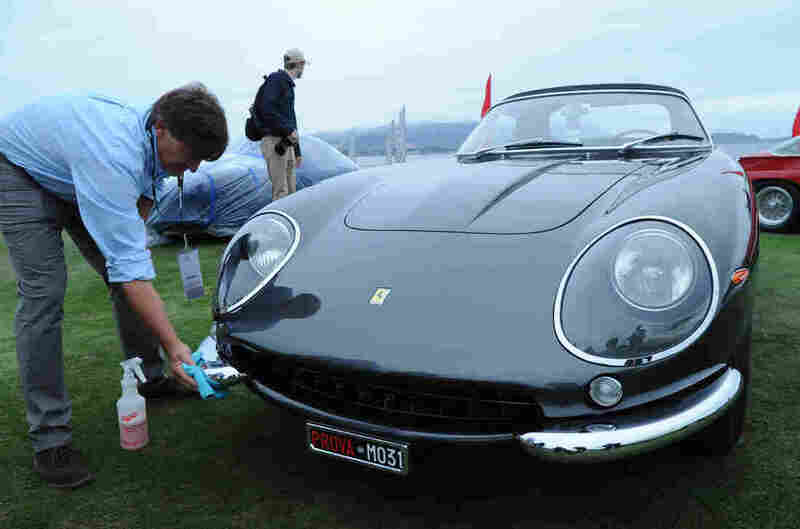 Dan Schaefer does a last minute detail before judging on the 1968 Ferrari 275 GTS/4 Scaglietti NART Spider owned by Chris and Ann Cox, Chapel Hill, N.C. Just 10 examples of this car were built and this is tenth one. That’s just the end of a week of car madness, when cars take over the coastal towns of Monterey, Pebble Beach and Carmel by the Sea. The Monterey airport hosts an event of cars and airplanes. There’s the Tour d’Elegance, where show cars cruise the streets, a wild exotic car show on Cannery Row (Steinbeck fans wouldn’t recognize it), and, most importantly, plenty of public and private auctions. Take a look at the top 20 most expensive cars ever sold (publicly) and more than half were sold in or around car week on the Monterey peninsula. Wayne Craig (center) gives last minute instructions to the volunteer docents who lead tours and have knowledge of the cars. Mosing’s Ferrari goes for between $1.3 and 1.5 million dollars. His car wasn’t for sale, and it wasn’t entered in the big show. His car, a mere 27 years old, wouldn’t make the cut at Pebble. The Concours is about painstaking restoration. Left: Ferrari specialist, Tom Shaughnessy, assembles a tool kit for his client’s 1952 Ferrari 212 Inter Ghia Cabriolet before judging. The car is owned by Jimmy Page of Boca Raton, Fla. Right: Shaughnessy’s assembled tool kit for this specific car. Thomas Shaughnessy from Oceanside brought his 1958 Ferrari Ghia to show on the 18th hole. As he prepped his vehicle, Shaugnessy unrolled $25,000 dollars’ worth of tools. These look like ordinary wrenches and hammers, but when you’re restoring a classic car, it’s about the right tool for the right car. For the privilege of strolling on the greens of the course, an estimated 15,000 attendees paid $350. Men and women parade the fairway dressed to the nines, with hats and parasols. The show also draws its share of car loving celebrities, Jay Leno (naturally), former California Gov. Arnold Schwarzenegger, and ABC’s Michael Strahan were just a few of the bold name celebrities. As wealthy and star-studded as the show was, it’s hard not to be affected. Deep and profound love is shown these classic cars. Morris Lum was detailing a 1958 Dual Ghia, owned by Tom and Gwen Price of Belvedere, Calif. Lum uses a toothpick to get into the crevices. The Dual Ghia is an example of an extremely rare car, only 115 were completed and only 36 are known to have survived. 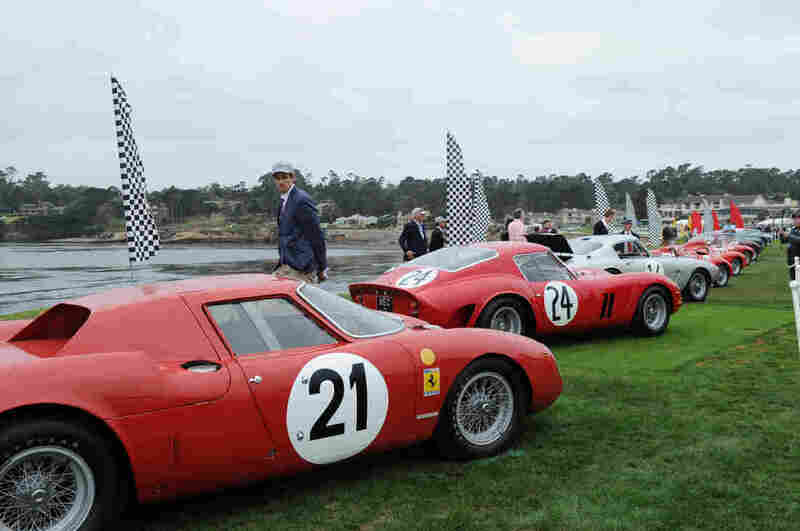 Ferrari race cars are lined up at dawn on Pebble Beach Golf Links’ 18th green at during the 67th Pebble Beach Concours d’Elegance. California’s Monterey Peninsula is home to the renowned car show that displays the most exotic, rare, and the most expensive cars in the world. Sandra Button has worked at Pebble Beach for 32 years. She started coordinating events at the course and began over the years to focus year round. Button has become one of the most prominent women in this male-dominated world. “They’ll call my husband instead of me ’cause it’s like a guy talk thing,” Button says with a laugh about the men who can’t believe she’s really the boss, when it comes to cars and Pebble Beach. Left: A Concours judge checks the undercarriage on the 1938 Lagonda V12 Rapide Drophead Coupe, owned by Ron Rezek. Right: Detailer Morris Lum uses a toothpick and microfiber cloth towel on his client’s 1958 Dual Ghia Convertible. Only 115 Dual Ghias were completed and just 36 are known to have survived. With self-driving and electric cars in the future, it’s not hard to see this antique car show as, well, antiquated. Button says she was reluctant to accept electric cars, but now she’s been converted. “They’re fun. They’re torque-y and you feel the power under you.” Button says as the world goes more electric, an issue for antique car lovers may be access to gasoline. That’s because, the future will come to Pebble Beach, eventually. For the privilege of strolling on the greens of the course, an estimated 15,000 attendees paid over $300. NPR’s Emily Bogle edited the photos for this story. Maquita Peters edited and produced it for the Web.